Specifically designed for endurance, performance and speedy hydration, R-Line Electrolyte Drink is packed with the perfect combination of electrolytes and carbohydrates so you can go faster and harder, for longer. This one litre concentrated bottle can make 10 litres of electrolyte drink, and with a wide range of tasty, natural flavours, you’ll be spoilt for choice. 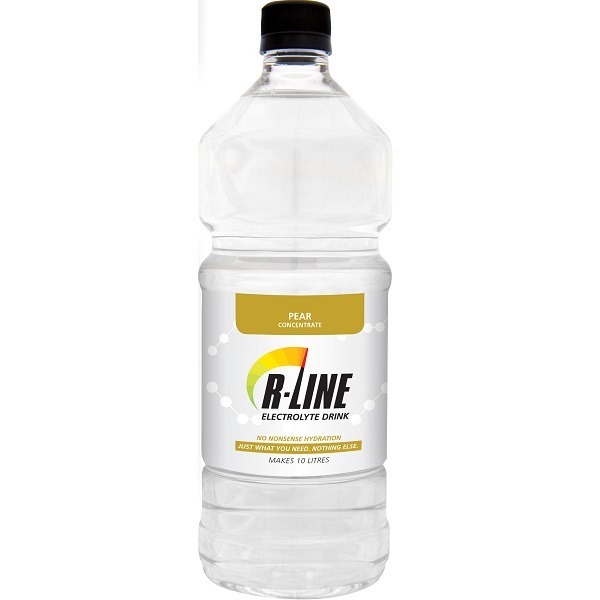 R-Line is made in New Zealand from local and imported ingredients to ensure a fresh taste we know you will love. These bottles comes with a handy 10ml pump, great for speed and convenience. R-Line is 10x concentrated so it couldn’t be easier to use. 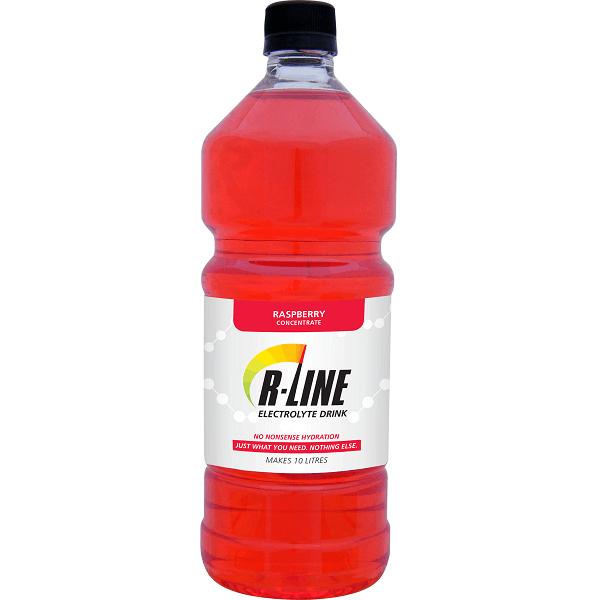 To Rehydrate, Refuel, and Rebound, R-Line is the answer. Ingredients: Water, sucrose, glucose, maltodextrin, acidity regulators (330,331), sodium chloride, natural apple flavour, preservative (202, 211), colour (102, 133). Ingredients: Water, sucrose, glucose, maltodextrin, acidity regulators (330,331), sodium chloride, natural orange flavour, preservative (202, 211), colour (110, 102). Ingredients: Water, sucrose, glucose, maltodextrin, acidity regulators (330,331), sodium chloride, natural lemon and lime flavour, preservative (202, 211), colour (102, 133). Ingredients: Water, sucrose, glucose, maltodextrin, acidity regulators (330,331), sodium chloride, natural blueberry flavour, preservative (202, 211), colour (133). 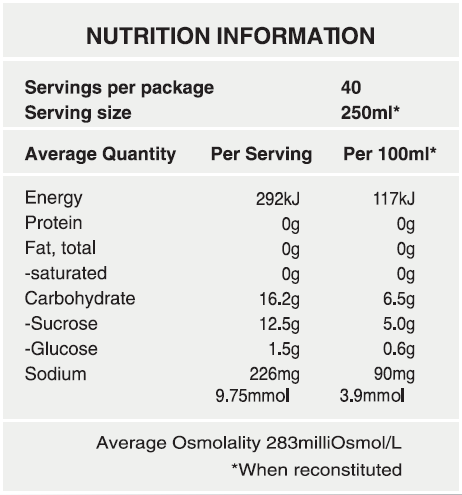 Ingredients: Water, sucrose, glucose, maltodextrin, acidity regulators (330,331), sodium chloride, natural raspberry flavour, preservative (202, 211), colour (124). Ingredients: Water, sucrose, glucose, maltodextrin, acidity regulators (330,331), sodium chloride, natural guava flavour, preservative (202, 211). Ingredients: Water, sucrose, glucose, maltodextrin, acidity regulators (330,331), sodium chloride, natural apple flavour, preservative (202, 211). Ingredients: Water, sucrose, glucose, maltodextrin, acidity regulators (330,331), sodium chloride, natural orange flavour, preservative (202, 211). Ingredients: Water, sucrose, glucose, maltodextrin, acidity regulators (330,331), sodium chloride, natural lemon and lime flavour, preservative (202, 211). Ingredients: Water, sucrose, glucose, maltodextrin, acidity regulators (330,331), sodium chloride, natural blueberry flavour, preservative (202, 211). Ingredients: Water, sucrose, glucose, maltodextrin, acidity regulators (330,331), sodium chloride, natural raspberry flavour, preservative (202, 211).